It’s almost end of June right now and we can definitely feel summer vibes where I live. The weather is a bit off lately and we have a lot of rain, but when the sun is out, the days are very hot. 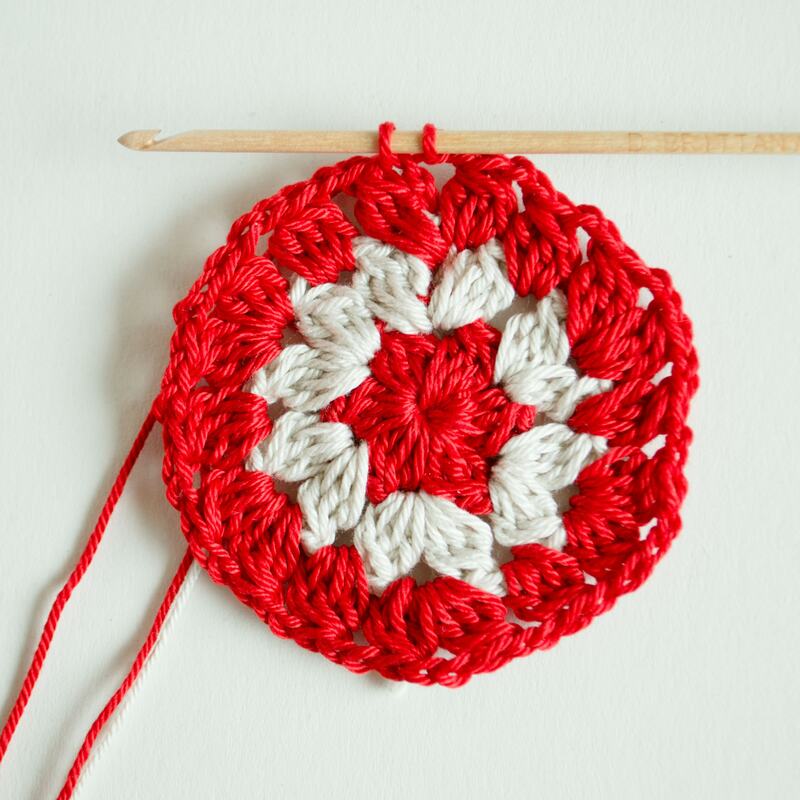 I was very busy with my personal life lately (well aren’t we all) so I haven’t had time for any crochet projects. 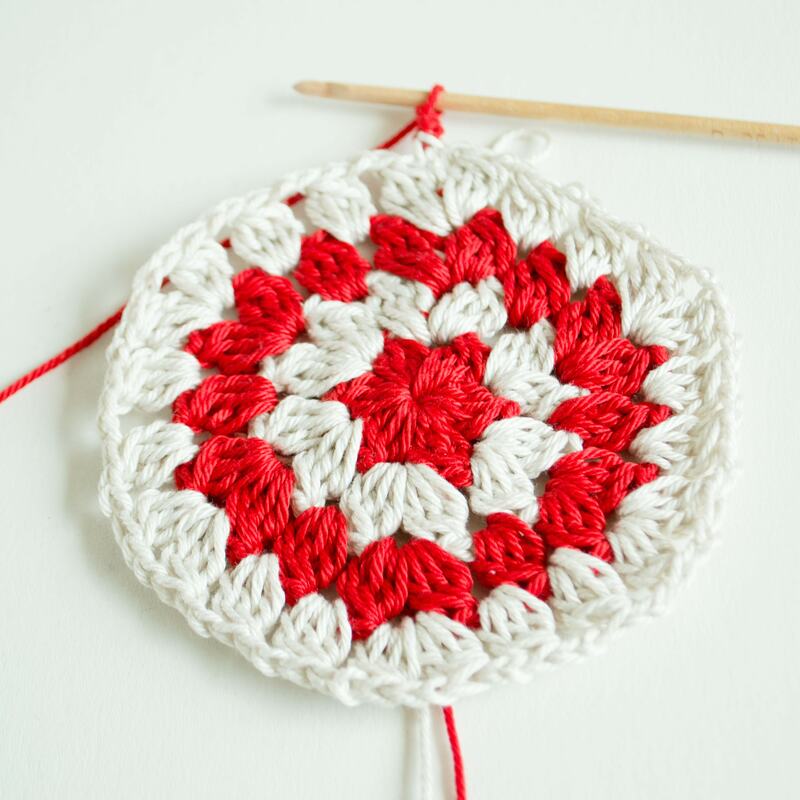 I hope I will be back soon… Meanwhile, I decided to create and write down the pattern for this lovely crochet coaster. I use it as a plate coaster, but you can definitely finish crocheting few round before my pattern ends and use it as a cup coaster. 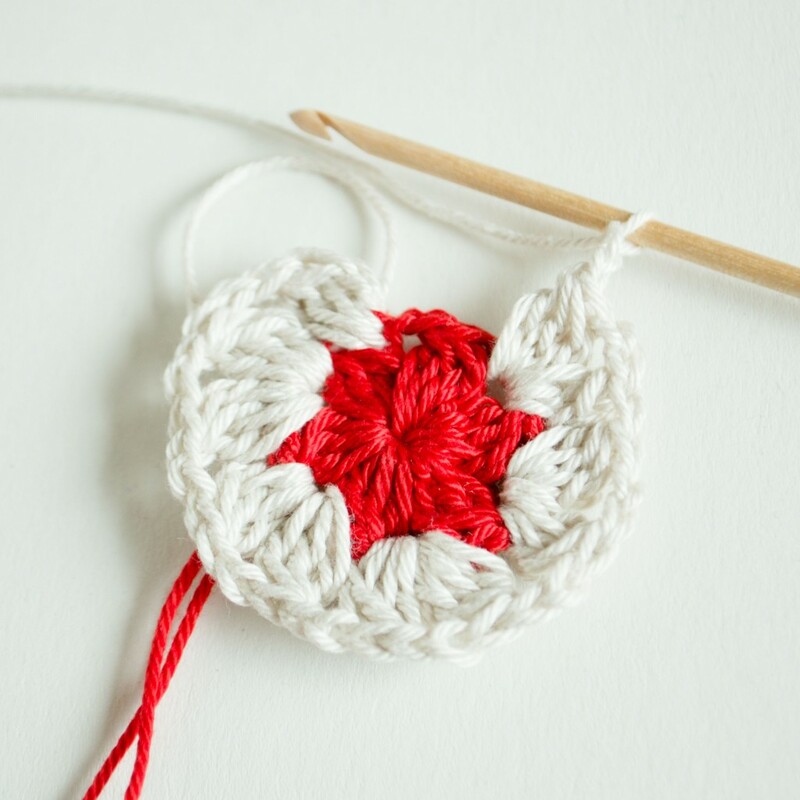 Hope you will enjoy the pattern! 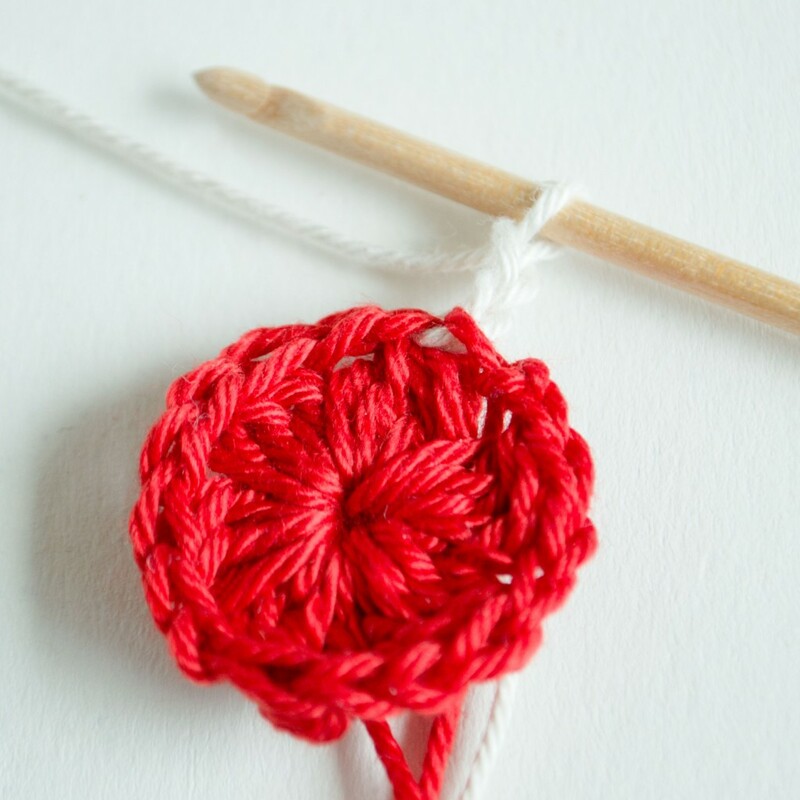 Please share the pattern with all of the lovely crocheters out there! Don’t forget to subscribe to my blog and follow my work on Facebook, Instagram and Pinterest for more patterns to come. 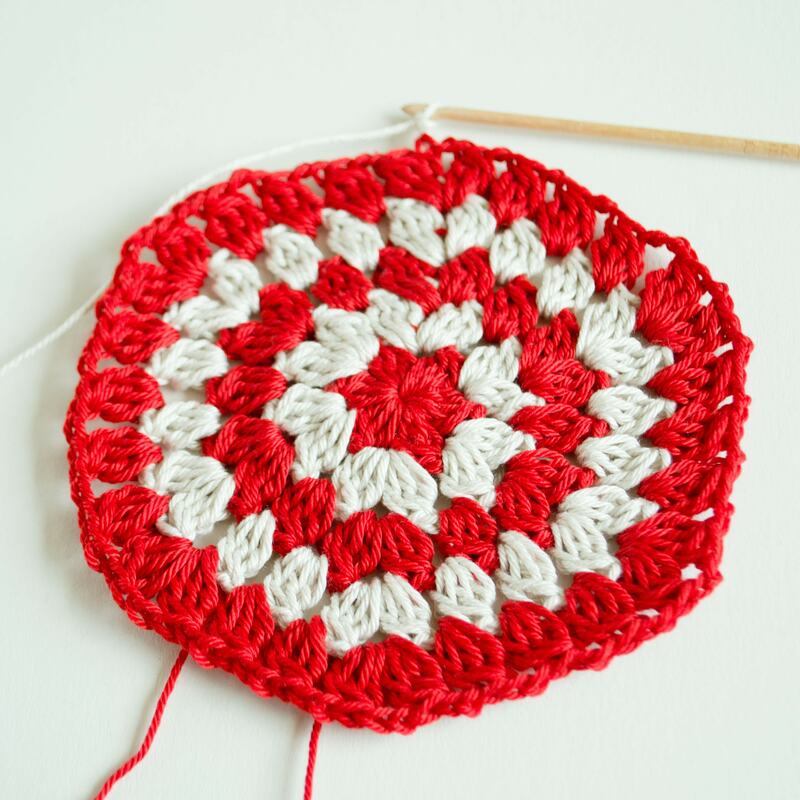 Share your work made using Croby patterns with me. Use #crobypatterns. 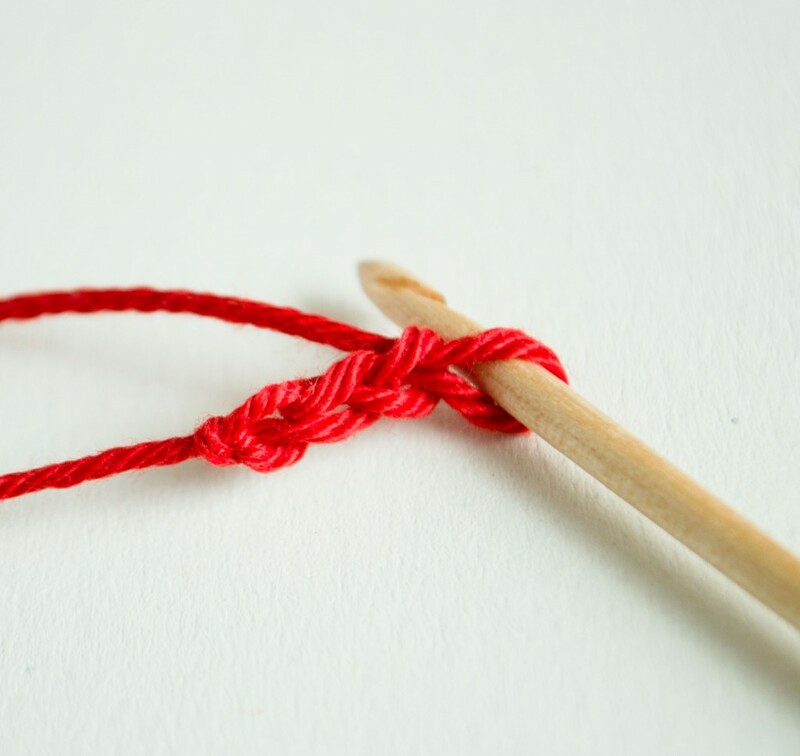 Ps – Puff stitch – my puff stitches are made of 3 dc stitches – is same as dc3tog made into the same stitch, or in my case around the same chain. 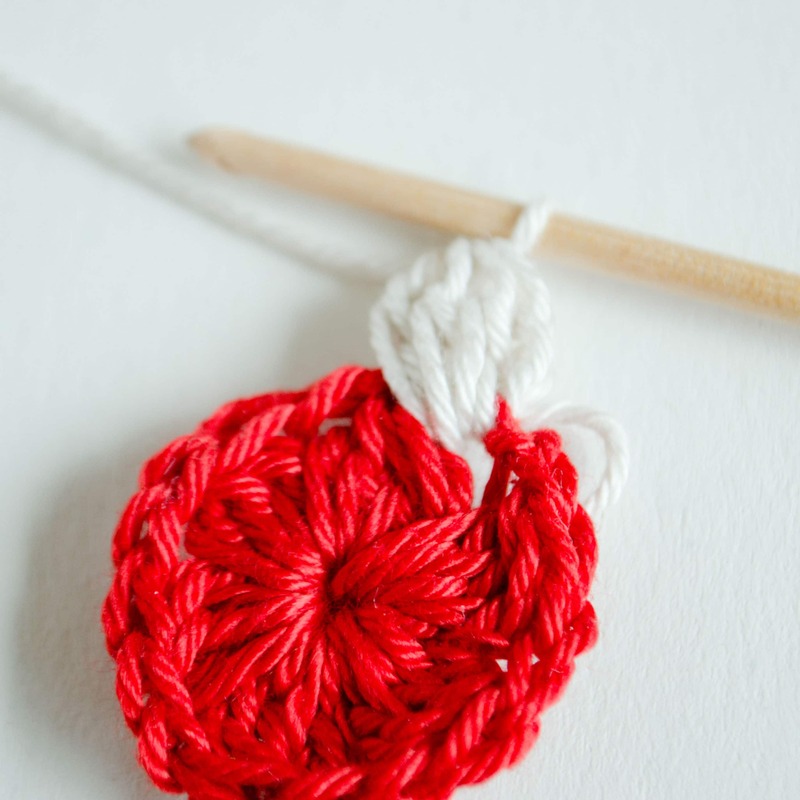 Take the red yarn and work chain 3 and join the last chain with first chain you made with ss. You’ve created a circle. Now you will be working NOT into the chain, but AROUND the chain. Ch 2. Repeat (ps around the chain, ch 2) 6 times. Join the round with the ss into the first ps of the round 1. Now use the beige yarn. Ch 2. Now follows the very important step. Work first ps around the last chain made in round 1 as seen on the picture. You will repeat that step each round when you will be working on the first ps. Ch 2. Repeat (Work ps than ch 2 two times around the same chain) 5 times. As you can see the first ps around the last chain from the round 1 is already made. So you will need one more. Work ps around the last chain from the round 2, ch 2. Join the round with ss into the first ps of the round. Change the yarn color. Ch 2. Work the first ps around the last chain made in the previous round. Ch 2. Repeat (Repeat (Ps around the chain, ch 2.) 1 time. Repeat (Ps around the chain, ch 2. Ps around the chain, ch 2)1 time.) 5 times. Work ps around the last chain from the round 2, ch 2. Join the round with ss into the first ps of the round. The idea of the evenly increase is to from now on, work increase part (ps 1, ch 2, ps 1, ch 2) into the increase part from the previous round. 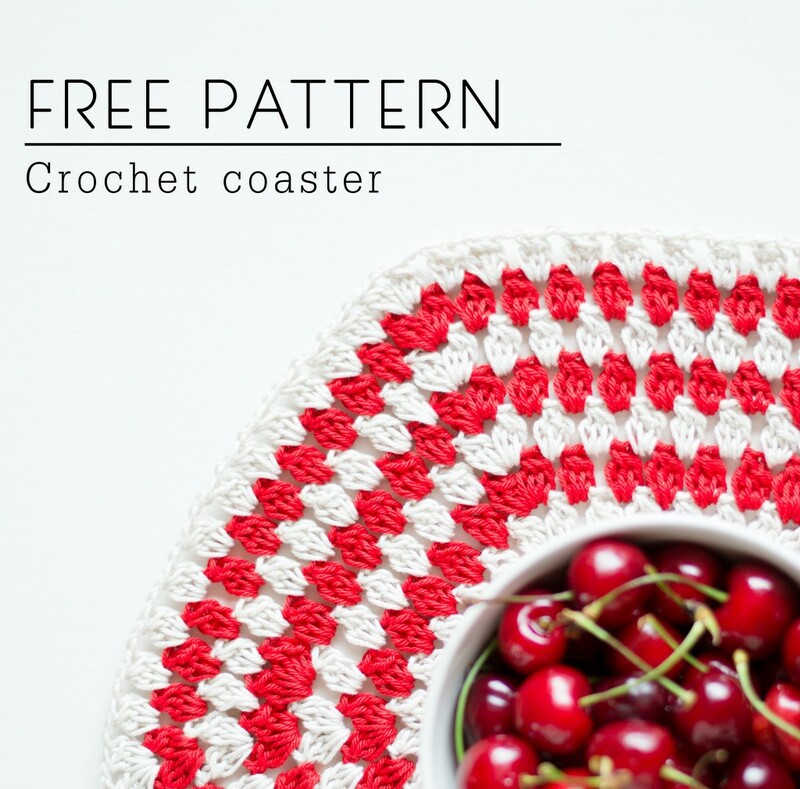 So you can create a cut coaster or even kitchen tablecloth if you want. Change the yarn color. Ch 2. Work the first ps around the last chain made in the previous round. Ch 2. Repeat (Repeat (Ps around the chain, ch 2.) 2 times. Repeat (Ps around the chain, ch 2. Ps around the chain, ch 2)1 time.) 5 times. Work ps around the last chain from the round 2, ch 2. Join the round with ss into the first ps of the round. Change the yarn color. Ch 2. Work the first ps around the last chain made in the previous round. Ch 2. Repeat (Repeat (Ps around the chain, ch 2.) 3 times. Repeat (Ps around the chain, ch 2. Ps around the chain, ch 2)1 time.) 5 times. Work ps around the last chain from the round 2, ch 2. Join the round with ss into the first ps of the round. Change the yarn color. Ch 2. Work the first ps around the last chain made in the previous round. Ch 2. Repeat (Repeat (Ps around the chain, ch 2.) 4 times. Repeat (Ps around the chain, ch 2. Ps around the chain, ch 2)1 time.) 5 times. Work ps around the last chain from the round 2, ch 2. Join the round with ss into the first ps of the round. Change the yarn color. Ch 2. Work the first ps around the last chain made in the previous round. Ch 2. Repeat (Repeat (Ps around the chain, ch 2.) 5 times. Repeat (Ps around the chain, ch 2. Ps around the chain, ch 2)1 time.) 5 times. Work ps around the last chain from the round 2, ch 2. Join the round with ss into the first ps of the round. Change the yarn color. Ch 2. Work the first ps around the last chain made in the previous round. Ch 2. Repeat (Repeat (Ps around the chain, ch 2.) 6 times. Repeat (Ps around the chain, ch 2. Ps around the chain, ch 2)1 time.) 5 times. Work ps around the last chain from the round 2, ch 2. Join the round with ss into the first ps of the round. Change the yarn color. Ch 2. Work the first ps around the last chain made in the previous round. Ch 2. Repeat (Repeat (Ps around the chain, ch 2.) 7 times. Repeat (Ps around the chain, ch 2. Ps around the chain, ch 2)1 time.) 5 times. Work ps around the last chain from the round 2, ch 2. Join the round with ss into the first ps of the round. Change the yarn color. Ch 2. Work the first ps around the last chain made in the previous round. Ch 2. Repeat (Repeat (Ps around the chain, ch 2.) 8 times. Repeat (Ps around the chain, ch 2. Ps around the chain, ch 2)1 time.) 5 times. Work ps around the last chain from the round 2, ch 2. Join the round with ss into the first ps of the round. Change the yarn color. Ch 2. Work the first ps around the last chain made in the previous round. Ch 2. Repeat (Repeat (Ps around the chain, ch 2.) 9 times. Repeat (Ps around the chain, ch 2. Ps around the chain, ch 2)1 time.) 5 times. Work ps around the last chain from the round 2, ch 2. Join the round with ss into the first ps of the round. Change the yarn color. Ch 2. Work the first ps around the last chain made in the previous round. Ch 2. Repeat (Repeat (Ps around the chain, ch 2.) 10 times. Repeat (Ps around the chain, ch 2. Ps around the chain, ch 2)1 time.) 5 times. Work ps around the last chain from the round 2, ch 2. Join the round with ss into the first ps of the round.